“Had we not had the ability to protect officers with those vehicles, I am afraid that we would have to engage people with our own gun fire,” said St. Louis County’s top cop Col. Jon Belmar. St. Louis County’s top cop – Col. Jon Belmar- said that the armored vehicles and .50 caliber machine guns used by police in response to unrest in Ferguson, Missouri helped keep civilians and law enforcement officers safe. While some have questioned the wisdom of a military policing model over the traditional public safety mission, Col. Belmar said it was really the presence of the armored personnel carriers and other equipment that allowed his officers not to fire on protestors. “I don’t know how we can responsible we would be as police administrators and not provide our young officers some protection,” Belmar said. 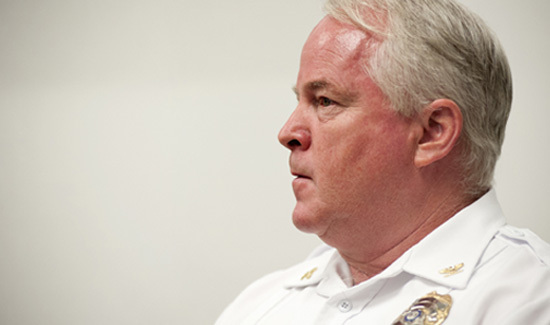 In the closed-door session in Chicago about the Ferguson response that was led by Belmar and St. Louis Police Chief Sam Dotson, there was consensus that police departments need to establish strict guidelines for when and how military-equipment is used, said Chuck Wexler, the executive director of the Police Executive Research Forum. It’s not clear if Chief Flynn meant a “Mumbai-style attack,” or if there are plans to have American law enforcement responding to active shooter incidents in other countries.